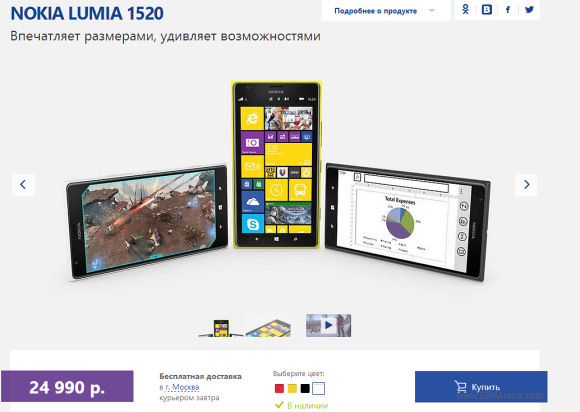 Nokia Russia has slashed the price of the Lumia 1520. The phablet launched in November for RUB29,990. (€630), but it seems Nokia is unhappy with its sales so it has decided to give it a nice RUB5,000 price cut. If you live in Russia, you can now have the Lumia 1520 for 24,990 (€525) - just overn €100 off the launch price. It's still a steep price, but the phone is a flagship material after all. You can check its pros and cons over our in-depth review. There is no official information on whether other markets will get the same discount as Russia on not. The Lumia sales aren't that great with Nokia selling just 8.2 million Lumias during the Holiday quarter, so we guess more price cuts will be happening soon.